This five seat reclining configuration is made from combining the modular components from this theater seating collection. Each seat features plush padding that you won't be able to wait to sink into it. The console separating the seats offers two hidden cup-holders and a hidden storage space. The sleek and contemporary style works great for entertainment spaces. This collection is made by an American furniture manufacturer. Items can be customized in an assortment of upholstery options. 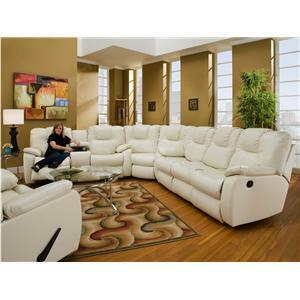 The Excel Five Seat Reclining Sectional with Chaise by Southern Motion at H.L. Stephens in the Arnot Mall, Horseheads, Elmira, Ithaca NY & Sayre, PA area. Product availability may vary. Contact us for the most current availability on this product. 866-07 Left Arm Facing Recliner 1 40" 38" 40"
866-84 Wedge with Connectors 1 70" 40" 41"
866-80 Wide Armless Chair 1 33" 38" 40"
866-59 Right Arm Facing Power Headrest Chaise 1 44" 64" 40"
866-46 Freestanding Console with Hidden Cupholders 1 13" 36" 35"
866-90P Armless Power Headrest Recliner 1 35" 38" 40"
This collection takes comfort and styling to a whole new level. 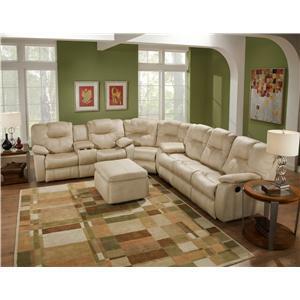 This group features a sleek contemporary design, but that doesn't mean that its skimping on comfort features. Each piece has superb seat padding and an expertly channeled seat back that you'll love to lay back on. Ideal for home entertainment spaces, it won't take long for you to fall in love with this collection! The Excel collection is a great option if you are looking for Contemporary furniture in the Arnot Mall, Horseheads, Elmira, Ithaca NY & Sayre, PA area. Browse other items in the Excel collection from H.L. Stephens in the Arnot Mall, Horseheads, Elmira, Ithaca NY & Sayre, PA area.